Mmm..just like the smell leads on this is one well balanced beer. Sweet flavors of toasted malt and bittersweet chocolate hit the mouth first creating a sweet yet dry flavor profile. But not to worry there are hops and they do make themselves present even though they are quite subdued. The hops come through only as a faint hint of earthy bitterness. But it's just enough to balance this mildy sweet flavors we tasted initially. The finish is sweet with some lingering bitterness on the back of the tongue. 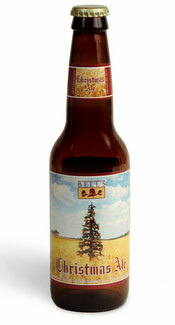 Appearance: This wintery scotch ale pours a crystal clear copper-orange. Gave a substantial off-white, three finger head that had great retention. Thanks to the good head retention it took a while for the foam to settle down to a smooth film leaving behind a beautiful lace on the glass. Smell: Pretty clean smell on this one. The main scent that comes through is a toasted malt, sweet yet not sugary sweet. There are some subtle hints of toffee, chocolate and some wheat-like grass/straw. There is a nice earthy hop aroma that comes through at the end letting you know it’s not just another sweet winter beer. Overall the smell is tame, sweet and inviting. Initial Taste: Mmm..just like the smell lead on this is one well balanced beer. Sweet flavors of toasted malt and bittersweet chocolate hit the mouth first creating a sweet yet dry flavor profile. But not to worry there are hops and they do make themselves present even though they are quite subdued. The hops come through only as a faint hint of earthy bitterness. But it’s just enough to balance this mildy sweet flavors we tasted initially. The finish is sweet with some lingering bitterness on the back of the tongue. I find this a very welcome respite from the spice-cake beers that overwhelm this season. Don’t get me wrong, I love spicy, high abv Christmas Ale and Winter Warmers but when it comes to a good winter session beer there aren’t many to choose from…well until now. <grin> This is simply a well crafted Scotch Ale. Sweet but not overly sweet, bitter but not overly bitter, just a well balanced easy to drink beer that will be great for the Christmas party or with Christmas dinner. I highly recommend for those people looking for a great session beer for the cold months.